Kung Pao Chicken is the ultimate stir fry experience. It is loaded with delicious peppers, scallions and peanuts in a sweet and salty slightly spicy sauce that leaves you licking your plate. 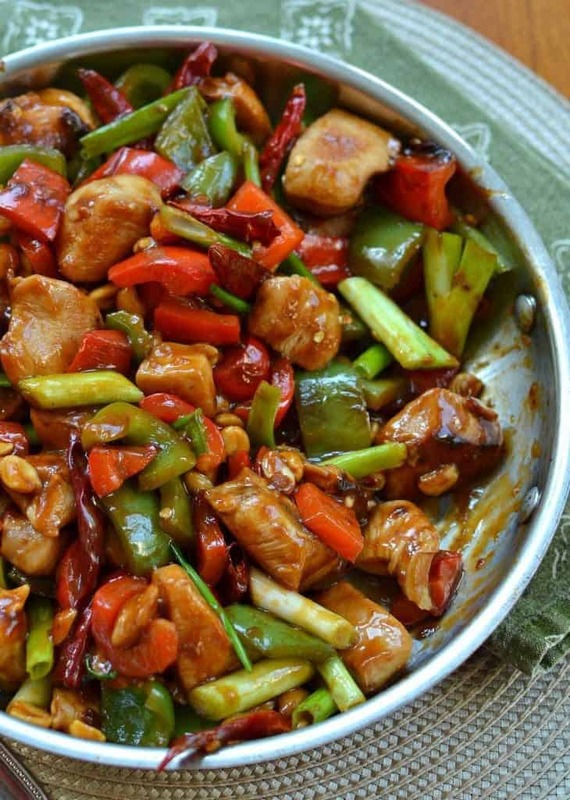 You really must try this amazing Kung Pao Chicken recipe. We absolutely love stir fry around here. It is fun and easy to prepare and chock full of vegetables and lean meat. There are so many things that can you do with stir fry and it is amazingly easy. Oh and did I mention how delicious stir fry dishes are. Veggies just seem to taste so much better when they are cooked crisp tender. You can make stir fry at home for a fraction of the cost of take out and you are in control of the ingredients. How do you like those apples? This One Skillet Kung Pao Chicken is one of our favorites and oh so darn easy. Are you in a hurry? Are you and the family trying to catch a movie? Cut your veggies ahead of time and store in the fridge covered with slightly damp paper towels. 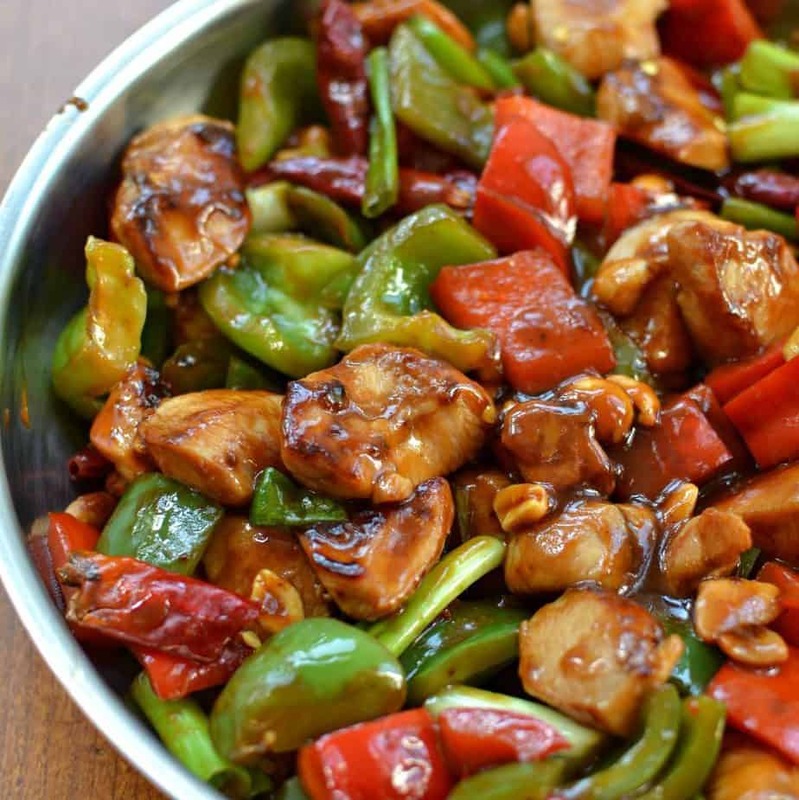 I kid you not folks this delectable Kung Pao Chicken recipe will leave you longing for more!! 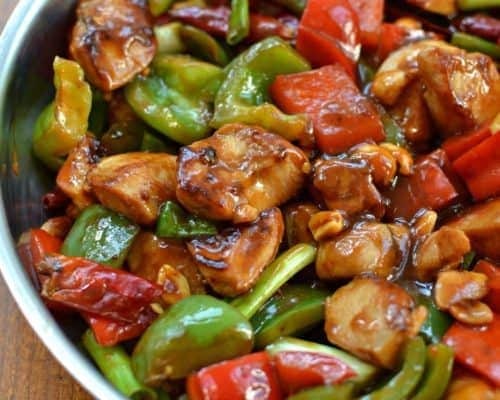 It is crisp tender pieces of chicken, sweet red and green bell peppers, scallions, peanuts and chili peppers in a tasty salty, sweet sauce infused with just a tad of heat. It is perfect served over white rice, brown rice or udon noodles. Going low carb? Skip the rice or noodles because it is just as tasty without it. Helpful hints when cooking stir fry!! Here are some helpful hints for cooking stir fry! Use oil with a high smoking point like canola, peanut or vegetable oil. Get the wok really hot. Don’t crowd the wok or skillet. Cook in batches and plate the veggies and meat. If your meat has a lot of moisture in it and it looks like your chicken or beef is boiling get the moisture out of the pan. You don’t want it to boil, you want it to stir fry. Cook the sauce last and add everything back to the pan for a quick warm up. Garlic can not be cooked at high heat as it will burn. Add it to wok with a larger group of vegetables that are done or almost done. Turn the heat down for thirty seconds and cook and then remove with rest of the veggies. Stir fry moves very fast and needs your full attention. This is not the time to call your bookie and place a bet. We are huge stir fry fans around here! So many stir fry recipes and so little time. Here are some more excellent stir fry recipes for your enjoyment! Kung Pao Chicken is the ultimate stir fry experience. It is loaded with delicious peppers, scallions and peanuts in a sweet and salty slightly spicy sauce. In large Ziploc bag combine cut chicken, sherry, 2 tablespoons soy sauce and cornstarch. Allow to sit for 30 minutes. Add 1 tablespoon vegetable oil to large skillet or wok and heat over high heat almost to smoking point. Remove chicken from Ziploc bag with tongs so excess liquid drains off and add chicken and cook until golden brown stirring frequently. If chicken is too crowded in pan work in small batches. Remove chicken to plate. Add 1 tablespoon vegetable oil to same large skillet or wok and heat over high heat almost to smoking point. Add red and green peppers and cook until crisp tender: about 3-4 minutes stirring frequently. Add scallions, peanuts, and dried chilies and cook for 1 minute. Remove to plate. In small bowl whisk together 2 tablespoons soy sauce, hoisin sauce, sesame oil, brown sugar, balsamic vinegar, chicken broth, sriracha and cornstarch. Cook in same skillet or wok over low heat until slightly thickened. Return chicken and vegetables to skillet or wok and warm for 1-3 minutes. I use low sodium soy sauce for all my cooking. Hoisin sauce, sesame oil. sriracha and sambel oelek can be found in the oriental section of most grocery stores. Dried chilies are usually found in the Mexican section or fresh produce section with the other dried peppers. I like to soak my dried chilies for about 30-60 minutes in lukewarm water to re hydrate them prior to cooking. If you don’t like too much heat cut the chilies open and remove seeds prior to hydrating them or cooking with them. Thanks so much! I really appreciate your kind words! I am so impressed with your recipes! I love it that you don’t use canned soups, processed foods etc…. Newly-retired, you’ve become my exclusive go-to! Thanks so much! I really appreciate all your kind words. I try to do my best. Have a wonderful day!! OMG………I want to have this tonight for dinner. So much better than take out. And you can control the salt intake. Love your recipes it’s been what I have been looking for in a web sight. Fun and easy recipes for family and entertaining. Thank you for sharing. Yes indeed. So much better when you control the ingredients. Thanks so much for your kind words. It has been a crazy day with tech problems so this brings a smile to my face. Thank you again. Added zuchinni and schezewan chili sauce, and a about 2 tsp. rice vinegar. Great recipe! Thanks so much! I am glad that you liked it! Great choices for additions! Yummy! We love stir fry in my house too! It’s such a great way to have a good filling meal and use up all the leftover veggies from the week. Yum, this sounds fantastic. I am such a fan of stir frys. I didn’t realise you need to be careful about the type of oil you use, thank you for that tip. I am literally drooling! I love chinese food so so much. I will dare and cook this one, i am scared but excited. Thanks a lot for sharing. One skillet meals are my favorite. I bet my kids would really love this meal. Kung Pao chicken is my favorite dish! I look forward to making this. It looks insanely good! 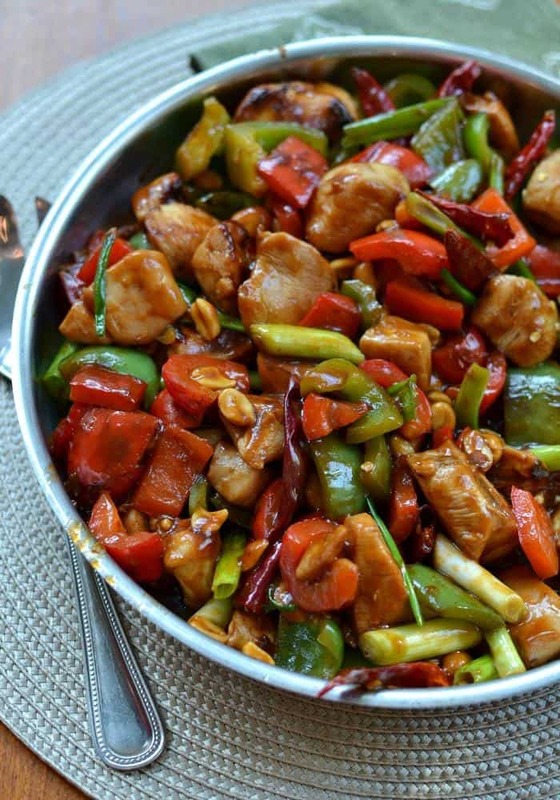 This Kung Pao chicken looks so delicious, I love it but don’t have if often enough. My kids love this meal too. I love this dish! It’s a perfect balance of the peanuts and peppers! One of my all time favorites; can’t wait to make this over the weekend! This looks like a delicious recipe! I would love to try making this sometime. 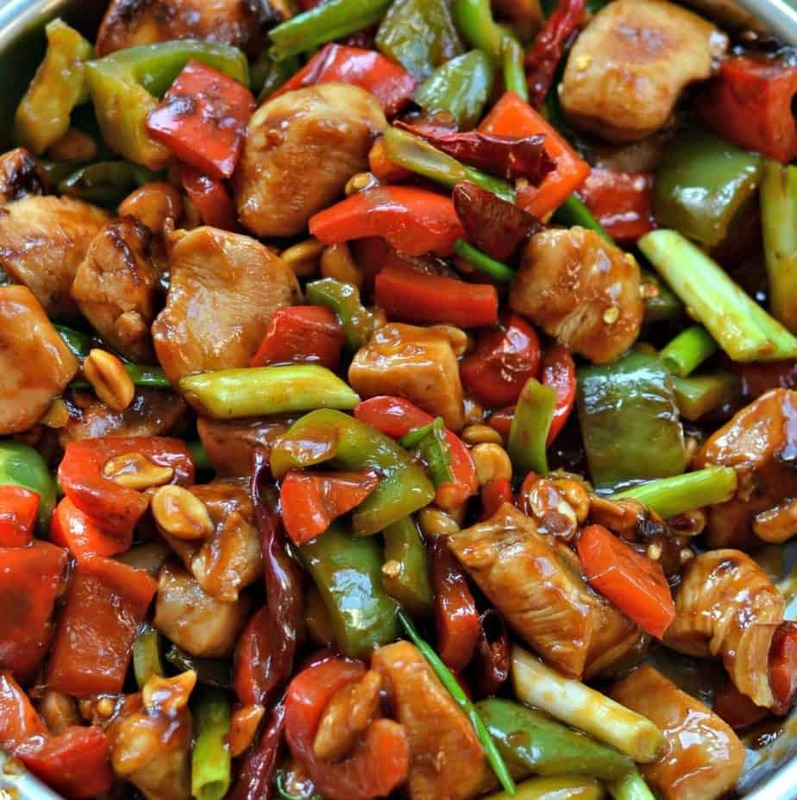 That look a mouthwatering and delicious Kung Pao chicken recipe. I would love to prepare them. This kung pao chicken looks flavorful. I will definitely give this recipe a try. My partner would love this for sure. That is great. I hope you both enjoy it! !